Fire may disrupt plant-animal interactions. In antagonistic interactions, this disruption may benefit one of the interacting species; for instance, the reduction of a seed predator after fire can benefit the host plant . The question is what happen in mutualistic interactions? Does fire disrupt mutualistic interactions generating negative consequences for the interacting species? The Mediterranean dwarf palm Chamaerops humilis is a small dioecious palm native to the coastal shrublands of the western Mediterranean Basin. It has a specialized nursery pollination system involving the weevil Derelomus chamaeropis (Curculionidae). 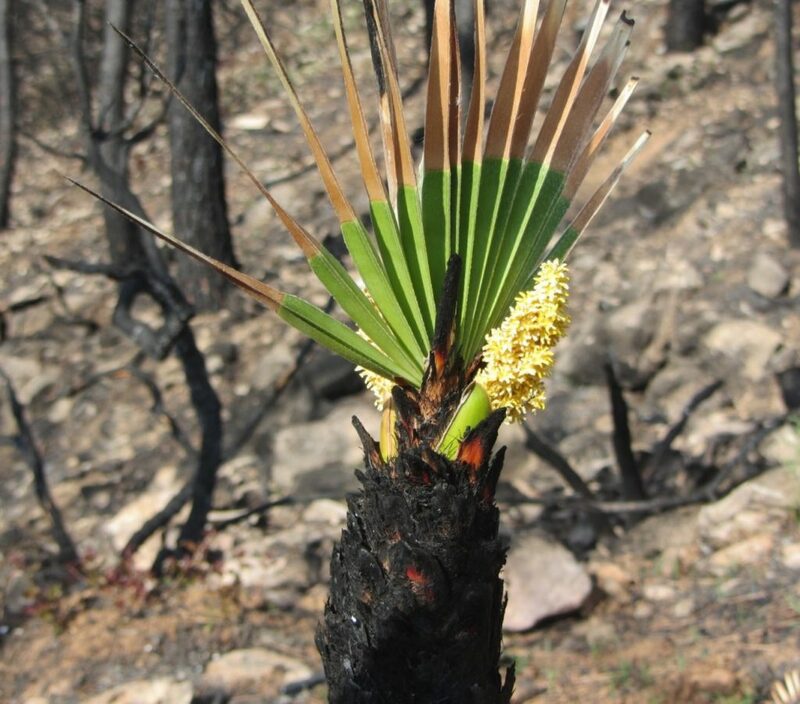 The plant resprouts quickly after fires (from apical buds) and produces flowers the following spring . Given the specialized nursery pollination systems, this plant is a good candidate to have their pollination disrupted by fire. In a recent study  we found that after fire, their pollinator (the weevil), was strongly reduced, but the fruit set remained unchanged. We documented a second beetle, a sap beetle (Meligethinus pallidulus, Nitidulidae), that were not affected by fire and acted as an effective pollinator (in a non-nursery pollination system). The temporary replacement by a sap beetle at burnt sites – an effective pollinator that had gone unnoticed until now – provided postfire reproductive resilience. That is, fire does not disrupt pollination in this specialized plant-insect system. This is an example of the “nature’s jazz hypothesis”, i.e., species have considerable scope and capacity to adapt to each other and their environments and thereby may impart far more resilience to environmental stressors and disturbances that was once thought . The dwarf palm Chamaerops humilis is well adapted to recurrent shrubland fires (i.e., of high intensity). It resprouts quickly after fire from surviving apical buds; it has rhizomes from where new stems can emerge after disturbance (I suppose this is why Humboldt mentioned this species as a social palm ); and its pollination is not jeopardized by fire. The mediterranean dwarf palm Chamaerops humilis flowering (male) 2 months after fire; Valencia region, Spain (photo: JG Pausas). Schmitz, O. J. 2018. Species in ecosystems and all that jazz. – PLoS Biology 16: e2006285.